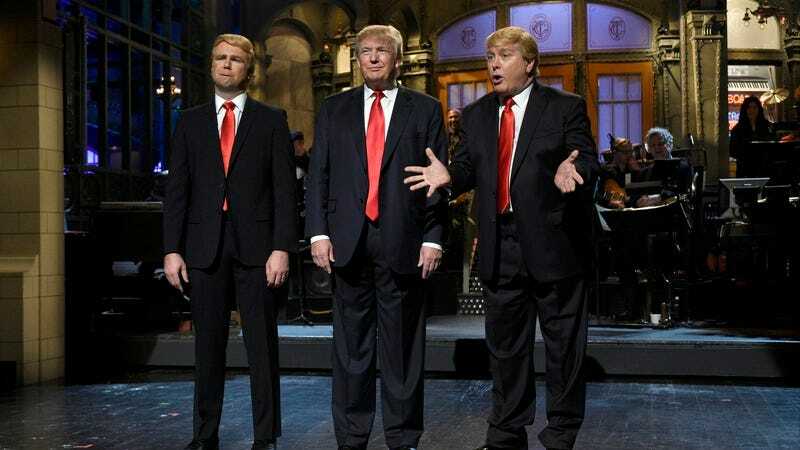 When Donald Trump hosted Saturday Night Live back in 2015, everyone involved managed to put a unified face in it: just a bunch funny people, spending quality time with a man they didn’t like, helping to humanize him so he could eventually be president. A year and a half (and a sudden departure from the series) later, and former SNL star Taran Killam is finally ready to open up about that week, touching on Trump’s time on the show during a longer interview with Brooklyn magazine. It was not fun, and most of the cast and writers were not excited to have him there. I didn’t get the feeling that he was excited to be there, and it felt like a move for ratings from both sides. He was… everything you see. What you see is what you get with him, really. I mean, there was no big reveal. He struggled to read at the table read, which did not give many of us great confidence. Didn’t get the jokes, really. He’s just a man who seems to be powered by bluster. Of course, Killam just finished directing a new movie, Why We’re Killing Gunther, with Trump’s Twitter nemesis, Arnold Schwarzenegger. So it’s possible he’s just biased, and Donald Trump was just as delightful to do high-pressure sketch comedy with as you’d naturally expect him to be.